Onion has a lot of benefits for the hair. When you learn how to make onion juice for hair growth, you will find that it smells heavenly and your hair will love it. ■Anti-bacterial properties and help fight infections of the scalp. ■Ability to reverse the effects of premature greying. ■Improve blood circulation there by improving hair growth. 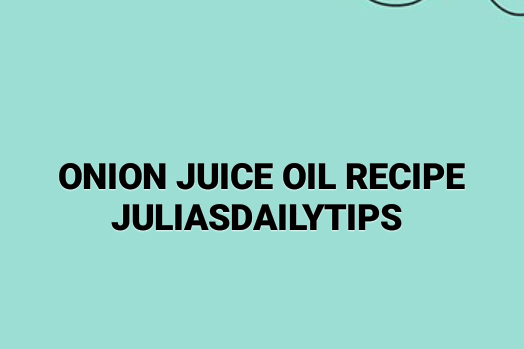 The smell of Onion Juice oil in the Hair is one thing that prevents people from using this natural hair growth treatment remedy, Adding essential oils to the onion juice after making it can help mask the smell of onion juice. Lemon oil and Lemongrass oil are one of the best essential oils for bad odor smell. They also have great benefits to hair. Lemon oil has antifungal properties that can help scalp control over production of oil and stimulate regrowth of hair. It also help clean the scalp by de-clogging hair follicles and prevent dandruff. Lemon grass contains citric acid, calcim, magnesium, vitamin C, pectin, and flavonoids. Lemongrass oil helps strengthen hair follicles and has antibacterial properties that promotes healthy scalp and produce healthy hair. However, if you are pregnant or nursing, do not use lemongrass oil. ■Strain the onion with a pantyhose or even a scarf or cheesecloth. ■Adding good scented essential oils are helpful in masking the smell. I like lemon, lavender or carrot oil. ■Allow to cool and Sieve with a cheese cloth. ■Store in your bottle, you can do a hot oil treatment, apply before styling your hair or massage your scalp with it. Onion is packed with Vitamin C, Folate, Chromium and Quercetin. It has anti-bacterial and anti-inflammation properties. If you made Onoins juice oil would you mind sharing your outcome with us?? Would be delighted to read through and learn some few things. bak again to read through more, thanks for the info! of a user in his/her brain that howw a user can know it. Howdy, There's no doubt that your web site could be having internet browser compatibility issues. message houe a little bit, however instead of that, that is wonderful blog. topic that's been written about for years.